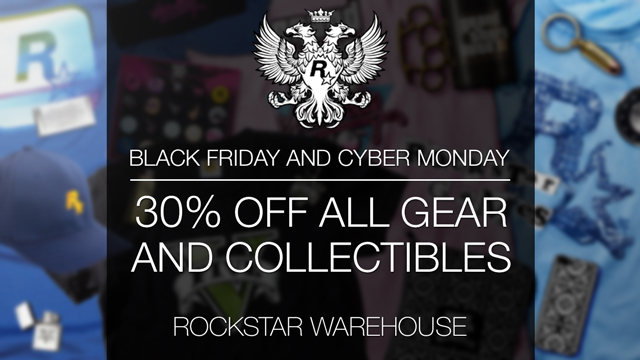 Beginning this Friday and running all the way through Monday, the Rockstar Warehouse annual Black Friday Sale features 30% off on all Gear and Collectibles. Choose anything from the Grand Theft Auto V Collection including popular gear and collectibles like the Zippo Lighter and GTAV Hoodie along with several items that weren't available last year at this time, such as the Body Bag Sleeping Bag and the Trevor Philips Industries Tee. Longtime fans can also take this opportunity to grab some Rockstar Apparel or gear and collectibles from some of the classic titles, including the Red Dead Redemption Frontier Collection and the Anniversary Collections for all three entries in the classic Grand Theft Auto Trilogy - GTAIII, Vice City and San Andreas. Also, all Warehouse orders over $50 will qualify for reduced international shipping. The Black Friday Sale begins Friday morning at 12:01am Eastern Time and ends at 11:59pm Eastern Time on Monday, December 1st. Enjoy and join the fun at the GTA V forums!